Every Monday the formal shops in our locality are closed in Delhi. I love to visit the markets on that day. The small informal traders put up stalls using bamboo sticks and iron bed and wooden platforms or just on a sack on the road and trade for about four to five hours usually in the evening. It is fun to see these stalls and the merchandise that they sell. Everything is for sale from old and new clothes to furnishing to vessels and trinkets. There is even a dedicated lane for selling fruits and vegetables. I enjoy watching the stall owners and the consumers interacting with each other and among themselves. That six feet by six feet of space on the road is of vital significance for those four hours to these people. The vendors have a system in place that caters to their needs. There is a water boy who sells water so the vendor (mostly a man, there are only a few Lamani’s- Gypsie women selling knives) does not have to leave his place. 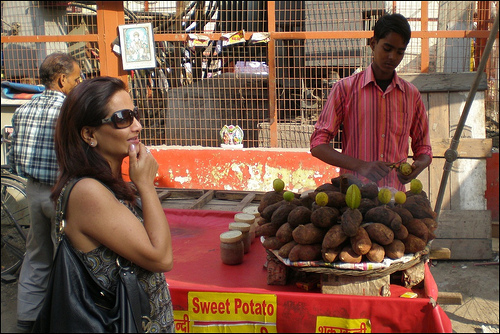 Then there is a boy who sells fried hard puris for snacks for the same reason. Their merchandise is displayed in a very orderly manner and with beautiful patterns.The prices seem to be pre-determined. So no one goes below the minimum agreed upon. There seems to be an unwritten rule that whoever is about to finish his fresh fruit and vegetable stock will sell it first at a discount. He is allowed to advertise the price and actively solicits the consumers. Last but not least the cops too manage the discipline the market by ensuring they stay beyond an imaginary line along the roads so that the vehicular traffic is not completely stopped. I walked into the Monday merrily observing the vegetable vendors and appreciating the freshness of the fruits and vegetables. I found ‘our’ formal fruit seller selling fruits too. We got into a conversation and I asked him ‘How come?’ to which he said ‘I have to have my feet in both the markets…’ Then he left me in mid conversation to join the crowd. There was a big commotion. A crowd gathered, some one was being beaten up and his merchandise disrupted. I saw him joining in too. Then the cops came and the crowd quickly vanished. One vegetable vendor who looked visibly bruised went back to his stall or what was left of it. ‘Our man’ came back. No one said anything to the cop including the victim. ‘Our’ fruit seller shared ‘this new vendor was acting too smart and trying new tricks to take away customers from others. We were watching him all this time. But when he crossed the limit today, we had to teach him a lesson. I too ‘washed my hands’ on him. But I punched him lightly. Who knows tomorrow may be my turn’. I asked what happens to the vendor who was beaten up. He explained, disrupted merchandise is punishment enough for him. He said if he is smart he will learn to conform quickly. If he is not he will not be able to survive here. He has a choice…don’t we all? Is this the rule of real world, being selfish is that much bad ? ?